Ethel Spowers was a painter and printmaker, best known for her linocuts. Born is Australia Spowers first began her art training in Paris in 1905 before returning to her home country to study at Melbourne’s National Gallery School in 1911 where she gained a reputation for children’s illustration. 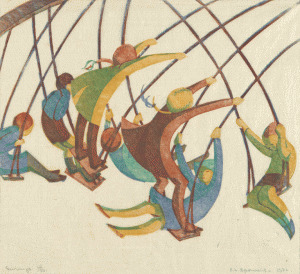 It wasn’t until 1927 when Claude Flight published his first book on linocuts that Spowers began experimenting with the printmaking technique, later enrolling at the Grosvenor School of Art, London to study under Flight. Along with Claude Flight, Cyril Power, Sybil Andrews and Lil Tschudi, Ethel Spowers became one of the key figures at the Grosvenor School. Championing the movement and it’s art in Australia by organising numerous exhibitions.